Explore the debunking of several common HVAC myths that will save you money. Because most newer homes have pretty standard HVAC systems installed, the average homeowner may think they know all there is to know about using one. However, there are a lot of myths floating around about heating and cooling systems that need to be busted once and for all. Alamance Oil wants you to know the truth so you can avoid expensive AC repair for your Burlington home. Myth 1: You Only Need to Change your Filters Once a Year. How often do you change your HVAC filters? Every year as part of your spring cleaning regimen? If that’s the only time you replace your old dusty filters, you could be causing unnecessary harm to your central air system. Clogged filters don’t allow the intake vents to pull in the air your HVAC system needs in order to operate properly. Dirty filters will also let extra dirt and dust get into your system which lowers its efficiency. Changing your filters twice a year is good, changing them quarterly is better, and changing them monthly is best. Myth 2: An Energy Efficient HVAC System Automatically Saves you Money. False. An energy efficient system will maximize energy usage, meaning your energy bills should be lower, right? Not necessarily. Other factors affect your energy bills such as insulation and other sources of energy usage in the home. It is also important to select the right size HVAC system for your home. Always consult a reliable company that offers services such as AC repair, maintenance, and replacement, to recommend the best system for your home. Myth 3: Closing the Vents in Unused Rooms Saves Energy. This is one of the most harmful myths about HVAC systems. 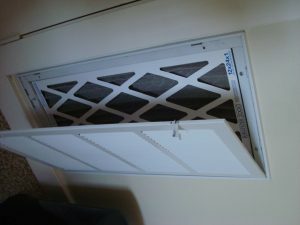 Closing vents in certain rooms will not save energy. In fact it will cause problems with your system by causing the air pressure to become unbalanced. Your AC will struggle to keep proper airflow throughout your home and the system itself and could even cause leaks in the ductwork. Myth 4: HVAC Maintenance is a Scam. Wrong. The truth is, HVAC companies make more money off of customers who call for emergency repairs or those who need their systems replaced more often because of lack of maintenance. By paying a minimal yearly fee for a maintenance agreement with your HVAC company you avoid emergency repairs, save on your monthly energy bill, and get many more good years out of your heating and cooling system. Now that you know the truth about some of the most common HVAC myths, you can avoid pitfalls, save money, and stay comfortable in your home. Alamance Oil offers a Comfort and Protection Service Plan for twice-yearly AC repair in Burlington to keep your system running efficiently. Call (336) 226-9371.